American Beauty Car Show is an international event that is directed to american cars and culture lovers since 2001. American Beauty Car Show is one of the most unique car events in nearby countries for it’s location and concept. The event consists of car exhibition, reunion, drag race, glorious american car cruising through the city and of course entertainment by local and international bands. Car exhibition and concerts are held in a very unique place, which is a historic medieval bishop’s castle. The event has grown in years and takes over almost whole Haapsalu old town. During the car show weekend Haapsalu old town is only open for american vechicles, creating an american atmosphere. If every american vehicle is welcomed to the tenting area no matter of the car’s condition or year, then to the exhibition only the cars with organisers approval are allowed. There are around 100 exhibition cars, you can see classics, customs, hot rods, muscle – and sport-cars. There are vechicles from Estonia, Finland, Sweden, Norway, Latvia, Lithuania and Russia. American Beauty Car Show has become the deadline of different car projects, which means that many cars are shown here for the first time. There are also local car clubs, who introduce people their activity and gather new members. It is an open air event in the middle of summer, where it is comfortable to come with the whole family and enjoy the special atmosphere of small seaside resort town. There are two free tenting areas for american car owners, one is located right behind the castle yard and the other one is few hundred meters away from the seaside. There is catering in both tenting areas, where it is possible to buy food and beverages. It is also allowed to use your own grill. There is various catering possibilities in American Beauty Car Show, everyone can find pleasing food from donuts to bbq meat. Beside the tenting area you can also find catering in the castle yard, in the museum park near the castle yard and beside the main street. The main events of Sunday are cruising and drag race. 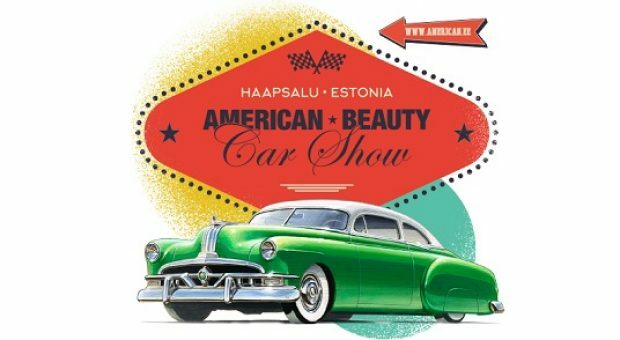 All american cars participate in cruising and some have even specially driven to Haapsalu to ride along with other beautiful cars through the city. Car parade is very popular with locals, every year thousands of people gather to the streets to wave at the passing cars. The big cruising will go to airfield, where drag race takes place and puts a powerful and tire smoking ending to the event. The music focus is on rock, rockabilly, blues and country – therefore all the music that is from America or has an american flavour to it. The goal is to get more and more artists from America, who you can see and hear only in American Beauty Car Show. This year American Beauty Car Show afterparty will be held in a small cozy old town club, where it is possible to see burlesque show and of course dance. American Beauty Car Show is an event for the whole family, where grown ups and family’s smallest members have a great time. Besides the car exhibition, music and food, grown ups can find themselves shopping, go to the barbershop or have a tattoo. Ladies can dive into the pin up world with dresses, make up, hair-dues and photo shoots. Children can have fun on the playground with trampolines, horse riding, face painting and theatre.